Jezebel is committed to bringing readers quality shark news in an effort to highlight the wonder of these incredible and deeply misunderstood creatures. 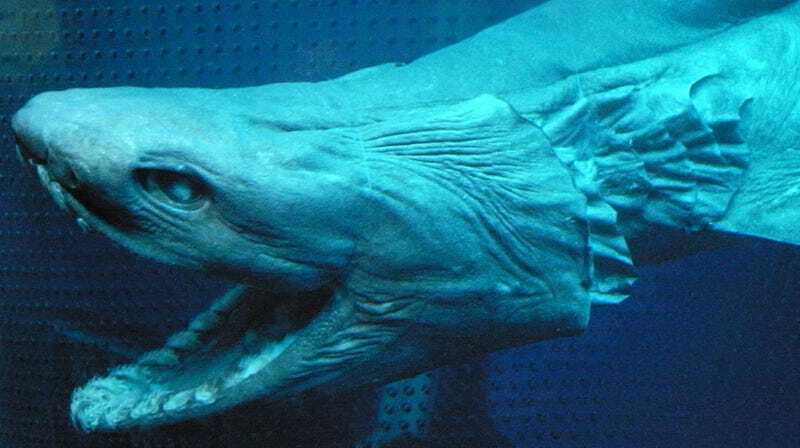 Today’s dispatch focuses on the frilled shark, a species which scientists believe lived more or less unchanged for 80 million years and which is rarely spotted by the human eye. Samuel Garman was one of the first scientists to study the animal, back in 1883. He believed its snake-like qualities inspired legends of sea serpents. Scientists today think it’s likely they attack their prey the same way snakes do, by striking suddenly. But because there is very little footage of the shark, we do not know for sure. A striking snake-like shark with 300 teeth may sound scary, but don’t be fooled. According to Newsweek, their diet seems to largely composed of cephalopods. They like calamari as much as you do. And besides, you would be crushed to death by the weight of the ocean long before you encountered one of these ancient creatures. It is the rising waters that should terrify you, not the embodied markers of time swimming blindly in the dark. Yay, sharks! Am I Really Supposed To Believe AGAIN That Human Lives Are More Valuable Than Shark Lives???? ?